The BETA M manual stacker has a robust structure thanks to its 1150mm long fixed forks which ensure capacities of up to 1200 kg can be handled with ease. This manual stacker is easy to use and is always ready to use due to being fully manual, so no need to charge it up before use. 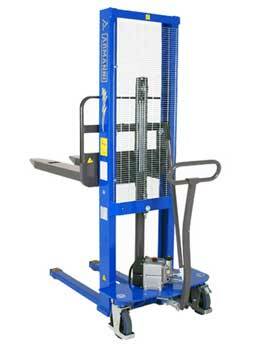 This manual stacker is operated with a hand pump, which gives the operator greater control over the load which the stacker is moving. A quick descent control is located in the handle of the hand pump (similar to a pallet truck), the BETA M is easy to control and maneuver, with and without a load. The BETA M represents the simplest and most economical solution in order to move medium-heavy loads in compliance with the current regulations.